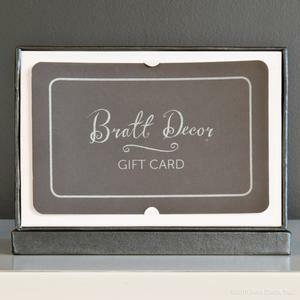 Give the perfect gift with a gift card from Bratt Decor. Easy to order and packaged for giving, our gift card is redeemable online or by phone. Here is your chance to tell others what you think of this product. Please enter your email in case we need to contact you regarding your review. Your email will not be displayed in the review. Please note: this form is for reviewing the product only. If you have a shipping issue, customer service issue or a damage issue, click here.